Conventional wisdom holds that Republicans are the party of the wealthy. But as Donald Trump’s campaign has clearly revealed, there are plenty of Republicans out there who are not particularly wealthy. 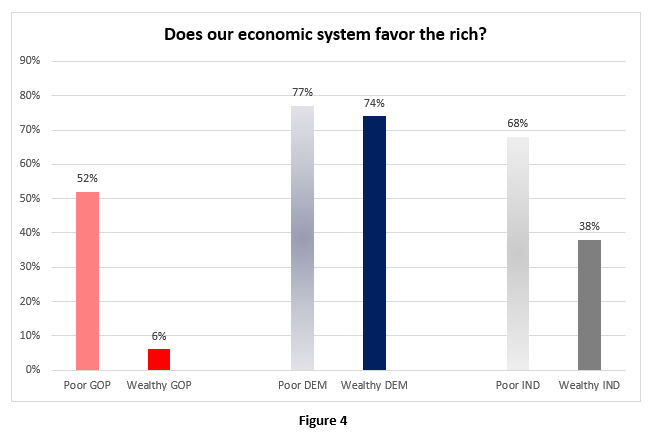 Conventional wisdom would say that more Democrats than Republicans believe that the economic system favors the rich The survey appears to validate that notion. You can see that 80% of Democrats polled believe that our economic system favors the rich, compared to only 27% of Republicans. Independents fall in the middle at 58%. 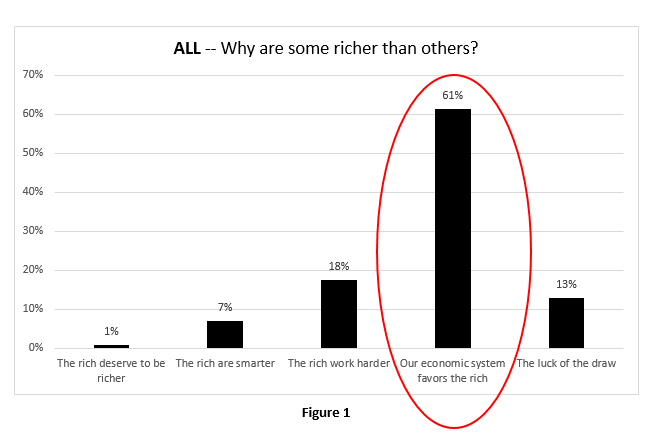 Conventional wisdom would further say that lower income people would be more likely to say that our system favors the rich. Again, the survey seems to support that idea, but not as dramatically. The blue bar represents respondents from households earning less than $50,000 per year. The gray bar shows those from households with incomes of over $150,000. 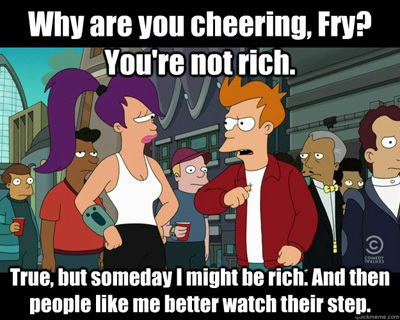 Seventy percent of the lower-income group believe that our economic system favors the wealthy. Only 46% of those with household incomes over $150,000 believe that. There might be an anomaly here, with 46% of the wealthy believing the supposition, and with only 27% of Republicans accepting that perspective. Is this a relatively small fissure between Republicans in general and the wealthy, or is it a great divide? We drilled down further and here’s what we found. Figure 4 represents the views of Republicans, Democrats and Independents, separated by household income level. 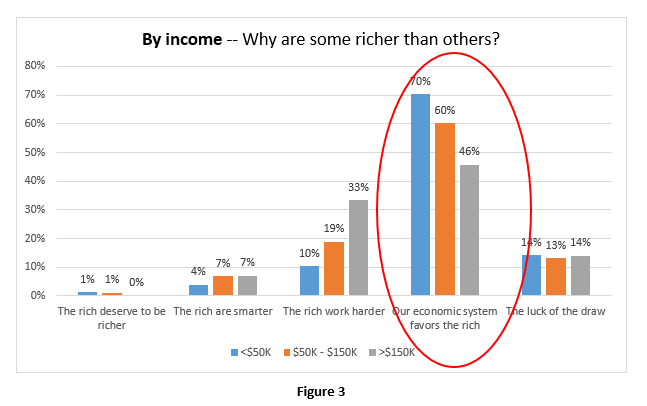 Inside the blue bars in the middle, we can see there is virtually no difference among Democrats of different income levels in accepting the premise that “our economic system favors the rich. Inside the red bars on the left, we see a monumental difference between wealthy and low-income Republicans. 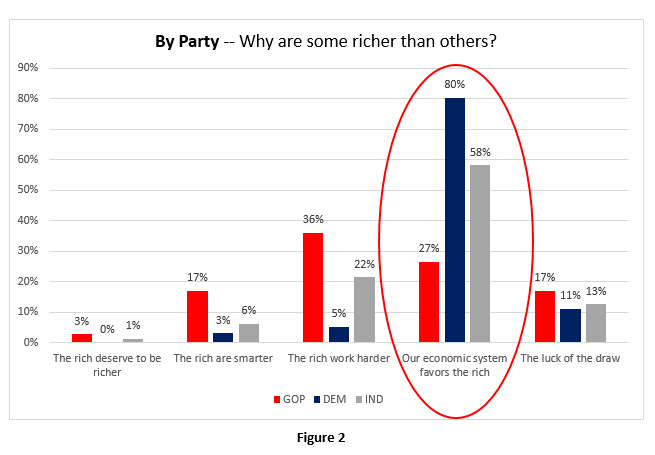 Only 6% of wealthy Republicans accept the premise that “our economic system favors the rich.” But for those Republicans who are members of low income households, fully 52% believe that “our economic system favors the rich.” This is nearly a nine-fold difference. On the question of whether our economic system favors the wealthy, there seems to be unanimity among Democrats, regardless of their household incomes. On the same question, there is a deep division among Republicans from high-income and low-income families. While this contention seems to make sense, it will require far more study. A larger sample size might yield more reliable results. We will conduct at least one further study examining these questions, and on the ultimate question we are asking: “Why are the Democratic and Republican brains so different from one another,” and what can we do to try to have a more fair and just America and world. Next Post:Democratic [and Republican] caucuses are not very democratic.